Michelagniolodi Lodovico di Lionardo di Buonarroti Simone was born in Caprese in Tuscany. The son of a civil servant, Michelangelo attended Latin School and studied painting in the workshop of the Ghirlandaio brothers as well as sculpture with Bertoldo, a formal pupil of Donatello. His early training derived from the great Florentine masters of the Low Renaissance: Giotto, Donatello, Masaccio, and Signorelli. A true Renaissance man, Michelangelo was gifted as a painter, a sculptor, an engineer, an architect, and a poet, but his preference was for sculpture, with its plastic possibilities for the revelation and exaltation of the human body. By the time he was 15, Michelangelo had attracted the attention of Lorenzo de'Medici and was invited to join the writers, scholars, and artists who frequented the Medici palace. This early experience and exposure to Neoplatonic thought influenced his ideals and concepts throughout his life. Michelangelo began as a sculptor and made his first statues between 1496-1501 in Rome. His first and possibly only easel painting was painted in about 1503, a tondo of The Holy Family in a closely knit triangular composition. His life coincided with a period of enormous papal power, and from 1505, whenhe signed the contract for the tomb of Pope Julius, Michelangelo was subject to political pressures, wars, papal orders, and counter orders. 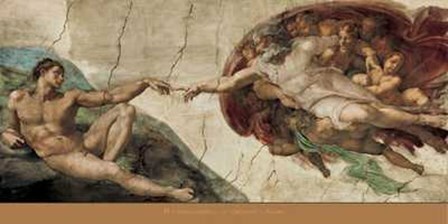 Michelangelo's greatest painting, the decoration of the Sistine Chapel, was painted singlehandedly between 1508-1512. The awe-inspiring work represents scenes of the Creation and the Old Testament through the story of Noah, and begins with Adam receiving the spark of divine life from God. The themes, divided architectonically, presented a complicated vision, miraculous in its variety and complete unification. Michelangelo began his Last Judgment in 1537, the fresco on the far wall of the chapel. Sculptural and architectural vision is replaced by swirling; space and more pictorial representation of tortured humans corresponding to the artist's own frustrations, unhappiness, and increasing religious doubts. In his last paintings (1541-1550) for the Paolino Chapel, Michelangelo was no longer the exponent of classicism but the forerunner of the Mannerist School. Michelangelo's genius influenced Raphael, whose work sums up the best of the classical Renaissance, and then Correggio, Jacopo Robusti Tintoretto, and countless other painters who have succeeded him through the centuries. Web Development and Web Design by Unified Development, Inc.